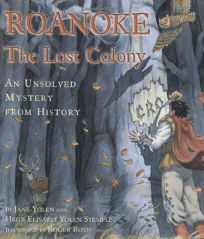 The third volume in the Unsolved Mystery from History series, Roanoke: The Lost Colony by Jane Yolen and Heidi Elisabet Yolen Stemple, illus. by Roger Roth, once again invites readers to use their detective skills to solve a puzzle from the past. In this intriguing entry, English colonists at Roanoke vanish sometime between 1587 and 1590, accompanied by atmospheric pencil and watercolor artwork.